Ohio Valley Conference Indoor Championships | Clarksville Sports Network - Clarksville Tennessee's most trusted source for sports, including Austin Peay State University. Clarksville, Tn – Sophomore sprinter Breigh Jones, of the Austin Peay State University track and field team, has been named this week’s Copies in a Flash APSU Athlete of the Week. Jones brought home a pair of silver medals from last weekend’s Ohio Valley Conference Indoor Championships. Nashville, Tn – Don’t call it a comeback. After entering the final day of competition at the Ohio Valley Conference Indoor Championships sitting in seventh place, Austin Peay State University women’s track and field team vaulted into third place thanks to a monster day on the track. 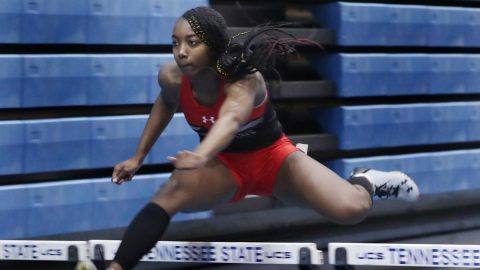 Nashville, Tn – While the points may not reflect it after Day One at the Ohio Valley Conference Indoor Championships, Austin Peay State University women’s track and field team finds itself in good position entering the final day of indoor competition. Clarksville, TN – Austin Peay State University women’s track and field team travels to Columbus, Ohio for its final tune-up before the conference championships at this weekend’s Buckeye Tune-Up, hosted by Ohio State.� The one-day meet begins 5:00pm, Friday, at the French Fieldhouse.